County Stadium, built mainly for a baseball team was the second home to the Green Bay Packers for more than four decades. Talk of a new stadium in the Milwaukee area were first discussed in the early parts of the 20th century. By November 1950, after years of discussion and planning, construction on a new stadium began. Built on the site of an old garbage dump, the stadium would be able to host numerous events, but was built mainly for baseball. Constructed of steel and concrete, the stadium was completed in April 1953 when the Milwaukee Braves (MLB) played the first game at County Stadium. It had a seating capacity of just over 28,000 when it opened and was built to be expandable. The stadium consisted of a double decked grandstand down the first and third base lines, a lower level of seating that extended to the foul poles and bleachers in various parts of the outfield. The Packers, who became part of the NFL in 1921, played part of their home games in Milwaukee for over six decades. Although Green Bay was the Packers home, the team played several games each season in order to have a larger fan base in Wisconsin. In Milwaukee the Packers played at Borchert Field (1933-35), State Fair Park (1936-1957) and Marquette Stadium (1952) before playing their first game at County Stadium on September 27, 1953 against the Cleveland Browns. By 1955 the NFL threatened to move the Packers permanently to County Stadium if a new stadium was not built for the team in Green Bay to replace City Stadium. However bonds were passed allowing for construction of Lambeau Field. Throughout its history County Stadium was expanded, beginning in 1954 when the grandstand was double decked down the foul lines increasing the seating capacity to over 43,000. For four seasons, 1966 through 1969, the Packers were the only tenant at the stadium, as the Braves moved to Atlanta. Baseball returned to Milwaukee in 1970 when the Seattle Pilots moved to the city and became the Brewers. 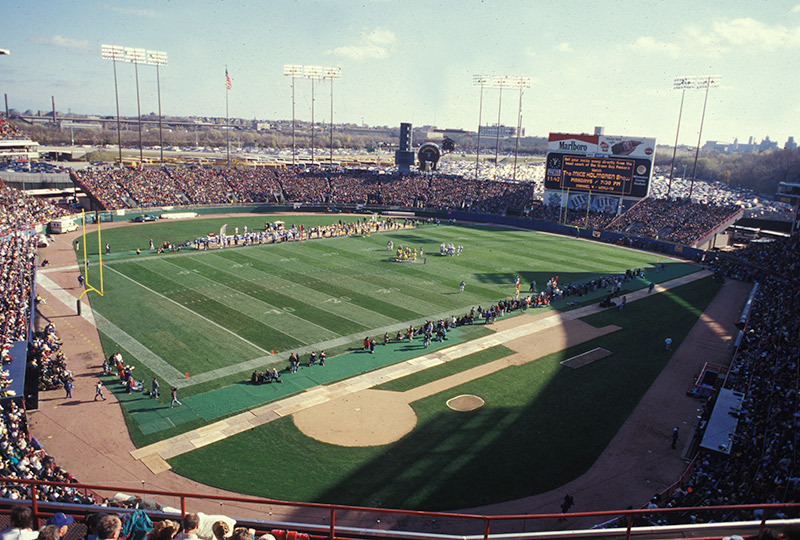 The Packers played nearly half of their home games at County Stadium for 41 years. In order for football to be played at the stadium, the bleachers behind the left field wall were moved into the playing area in left field. The gridiron was laid out over the infield and right field. Because of the field configuration, both football teams had to share the same sideline. The north endzone was so close to the third base dugout, oftentimes a player would disappear into the dugout after scoring. In the early 1990s after the Packers home in Green Bay Lambeau Field had been upgraded with more luxury suites, the team decided to move all of its home games there. 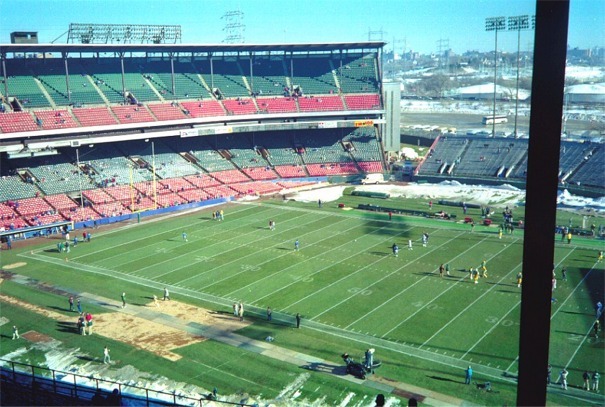 The Packers played their last home game at County Stadium on December 18, 1994 against the Atlanta Falcons. The Brewers continued to play at County Stadium for six more seasons before moving into Miller Park in 2001. County Stadium was demolished in December 2000 and is now the site of a little league baseball field.